NEW ORLEANS – Scholar Teams of the Year and All-Academic Team honors for the 2017-18 NCAA Division I Indoor and Outdoor Track & Field seasons were announced Thursday by the U.S. Track & Field and Cross Country Coaches Association (USTFCCCA). Programs that stood out the most during competition also handled business in the classroom as indoor national champions Florida and Georgia, as well as outdoor champions Georgia and Southern California were named Scholar Team of the Year. In order to be in contention for Scholar Team of the Year, a program must finish highly at the respective national championship meet and have at least a 3.00 cumulative team GPA. Florida’s men won the NCAA team title for the fourth time in program history and the first time since 2012. The Gators, who maintained a cumulative GPA of 3.19 during the indoor and outdoor seasons, topped runner-up Southern California by three points. Georgia’s women ran away with the team title as they scored 61 points to Arkansas’ runner-up total of 49. The Bulldogs, who maintained a cumulative GPA of 3.36 during the indoor and outdoor seasons, nabbed their second Indoor Scholar Team of the Year honor in program history (2017). This is the fourth year in a row that the SEC swept the Indoor Scholar Team of the Year award. The perennial power also did so in 2012 and 2013. Georgia’s men used a sterling effort to capture their first NCAA team title in program history this past June. The Bulldogs, who maintained a cumulative GPA of 3.14 during the indoor and outdoor seasons, totaled 52 points at Historic Hayward Field to outdistance Florida. 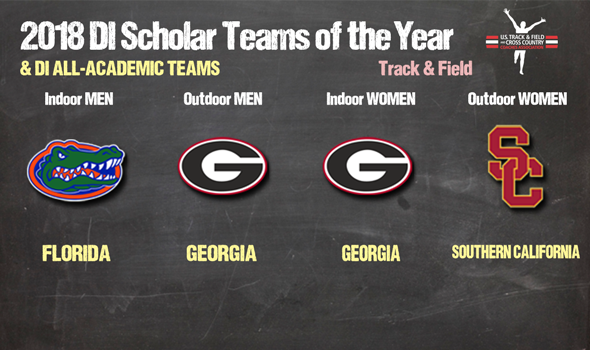 This is the second time that Georgia was named Men’s Outdoor Scholar Team of the Year (2014). Southern California’s women used a little bit of Hayward Magic to win the NCAA team title. The Women of Troy, who maintained a cumulative GPA of 3.13 during the indoor and outdoor seasons, watched Kendall Ellis notch an amazing comeback win in the 4×400 relay to edge Georgia. Southern California is the first Pac-12 team to win Women’s Outdoor Scholar Team of the Year since Oregon in 2015. All told, 361 teams were honored for their academics by the USTFCCCA. Breaking it down further, 220 of those were women’s teams compared to 141 men’s programs. The highest cumulative GPA of any team belonged to the University of San Francisco’s women for the third consecutive year. The Dons maintained a 3.76 GPA under head coach Helen Lehman-Winters. When it comes to men’s teams, both Lipscomb University and Marist College tied with a GPA of 3.53. See below for a full list of those All-Academic Teams in NCAA Division I Track & Field.